The Chinese celebration of the Lunar New Year, also known as Spring Festival, is a dazzling banquet for the soul that is laden with more symbolism than a Jungian interpretation of a Fellini dream sequence inspired by a Carlos Castaneda novel. And that’s one of the elements that I love most about the holiday: wordplay and homophones figure into the choices for traditional foods (more about that tomorrow) along with their colors and shapes. 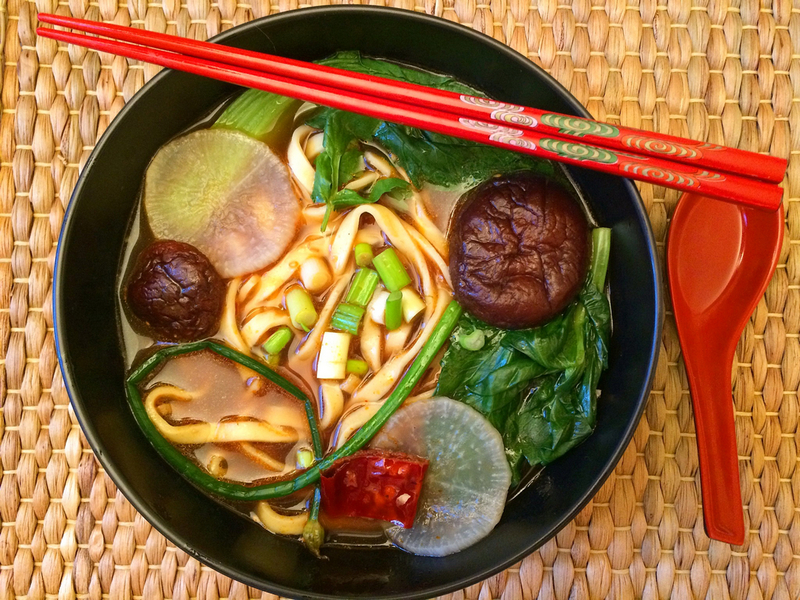 For Lunar New Year’s Eve (“Reunion Dinner”), I’ve prepared a duck soup with shiitake mushrooms, daikon, flowering chives, bean leaf, Shanghai bok choy, scallions, cilantro, dried red chili pepper, and too many seasonings to mention, but the focus is on the long noodles that are aspirational of a long life. This entry was posted in Home Cookin', Instagram and tagged Chinese, Holidays by Rich. Bookmark the permalink.